Leftover Homemade Chili dressed up on a corn tortilla. My Homemade Chili is infused with Ancho Chilies, adding a real smokey flavor to the dish. Add fresh grape tomatoes, diced red onion, cilantro, Queso fresco, and lime. Reinventing leftovers into a completely new meal. Alongside I served Mexican Style Corn On The Cob, grilled in their husks, smothered with a chili lime butter, and top with Queso Fresco. Link for Homemade Chili is at the bottom of this post. Mix butter, chili powder, Kosher salt, black pepper, and lime zest in a bowl set aside. Prepare indoor grill for medium-high heat. Gently pull back husks from each cob, leaving them attached at the bottom of the cob. Remove corn silks from the cobs, (do not worry if a few still cling to the corn cobs). Season by rubbing the cobs with the *compound butter. Pull the husks back into place, (they may be a little loose, but that’s fine. Next, grill the corn, turning frequently, until the husks are charred, and corn is tender about 10-12 minutes. Pull back the husks, sprinkle crumbled Queso Fresco over the corn and lime wedges. Enjoy! *Compound butter: Butter that has been mixed with fresh garlic, spices, and or fresh herbs. I’m using a boil-in-a-bag quick cooking brown rice for this dish. Truth be told I wasn’t sure about the taste of a quick cooking brown rice. The rice has a slightly nutty flavor. It’s really delicious. There are some really great products available in local grocery stores today. I’m okay with taking advantage of semi-homemade dishes. It definitely allows for more TV time. Boil the rice according to the directions on the back of the box. Let the excess water in the “cooking bags” drain completely before transferring the rice to a large bowl. Add in the rinsed and drained black beans, lime zest, chopped cilantro leaves, sliced green onions, Kosher salt, and black pepper. Finally toss all the ingredients together. 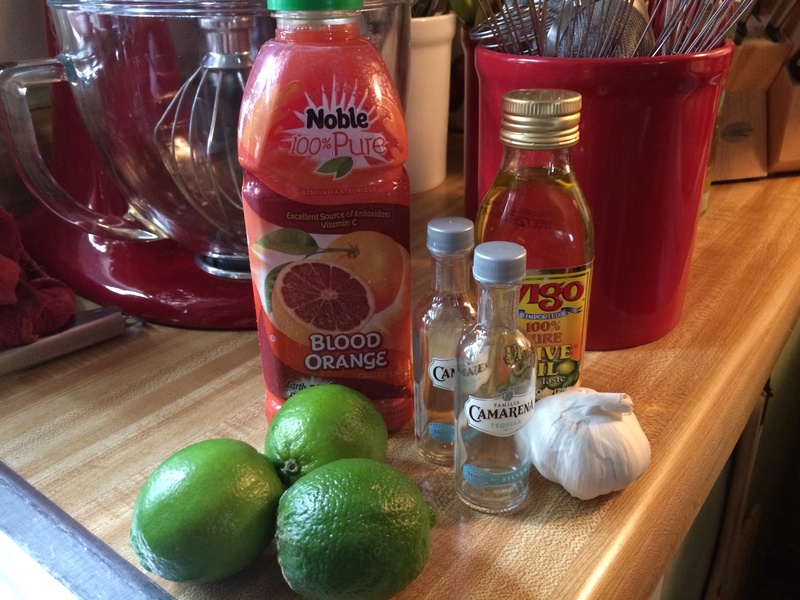 Blood Orange Margarita Chicken Topped With Fried Shallots is one of my favorite recipes. The chicken is so flavorful and easy to do you’ll want to make it all the time. The best thing is, you can marinate the chicken in advance. I like to do it overnight so the next day I can just throw the chicken into the oven when I’m ready. 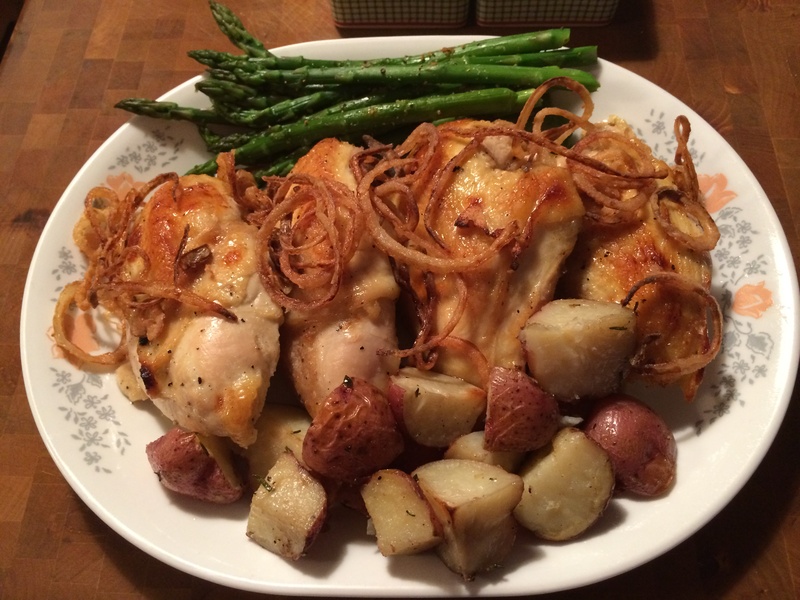 I’m going to serve this chicken with roasted potatoes and a Mocha Chili Spiced Roasted Asparagus. The recipe for my asparagus is available by clicking the link at the end of this post. I’ve posted a link at the end of this post that you might like called, Knowing Your Butcher. I share a few really great tips and tricks. 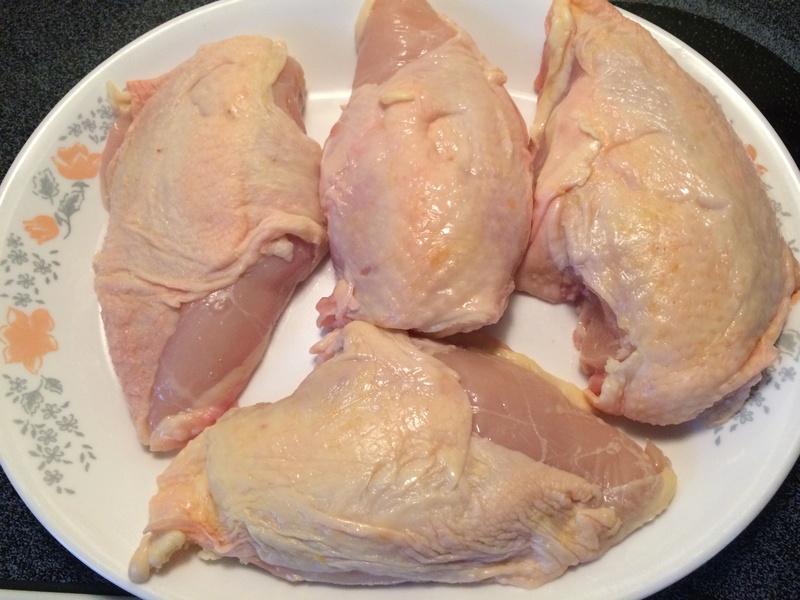 For this recipe, ask your butcher to remove the bones from the chicken breast, leaving the skin intact. Steve grills love to grill chicken thighs but he doesn’t use the skin. I take the skins and render the chicken fat. Basically, it’s similar to saving your bacon drippings. In a large sauté pan on medium-low heat, I melt the chicken skins until all the fat is completely rendered out, around 15 minutes. Transfer the melted chicken fat to a jar, let cool, then refrigerate. Today I’m going to use this chicken fat to make my roasted potatoes. I think these potatoes will be a great accompaniment to my Blood Orange Margarita Chicken Topped With Fried Shallots. The night before, marinate the chicken. 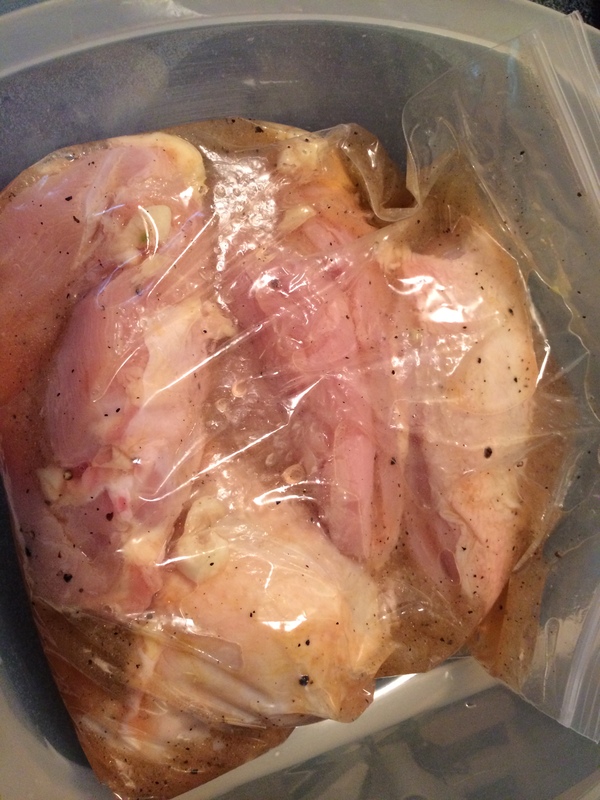 Place 4 skin-on boneless chicken breasts into a large (gallon size) zip lock bag. 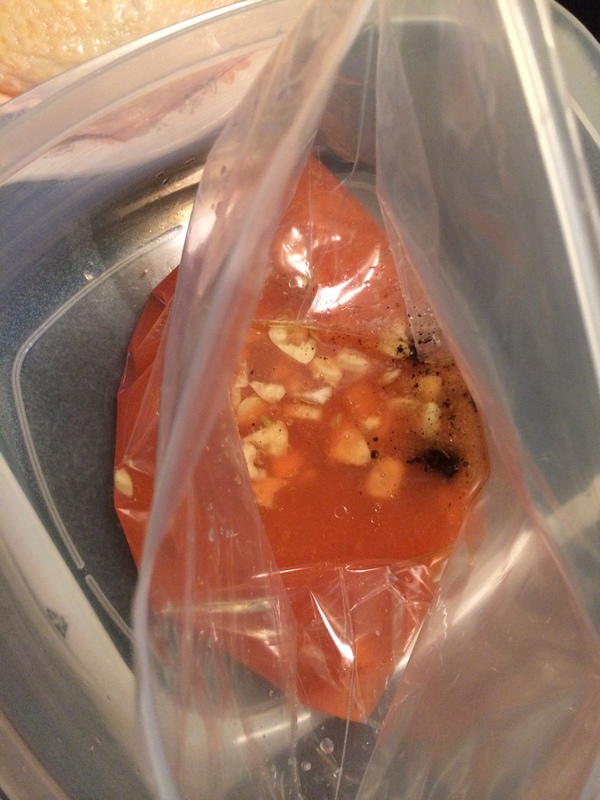 Add freshly squeezed lime juice, lime zest, silver Tequila, blood orange juice, whole cloves of garlic peeled and smashed, mined Fresno chili, olive oil, chili powder Kosher salt, and fresh ground black pepper, Release all the air from the bag then seal closed. Massage the chicken breasts so they’re all coated in the marinade. In a small saucepan on medium-low heat, melt the chicken fat. Once melted remove from the heat and set aside. Start by quartering the potatoes and adding them into a large mixing bowl with 1 tablespoon of Kosher salt, 1 teaspoon of fresh ground black pepper, and the melted chicken fat. Toss to combine. Spread the potatoes out in one even layer onto a baking sheet. Cook for 25 minutes or until the potatoes are golden brown on the outside and tender on the inside. Turn them once after 12 minutes to ensure they don’t stick. 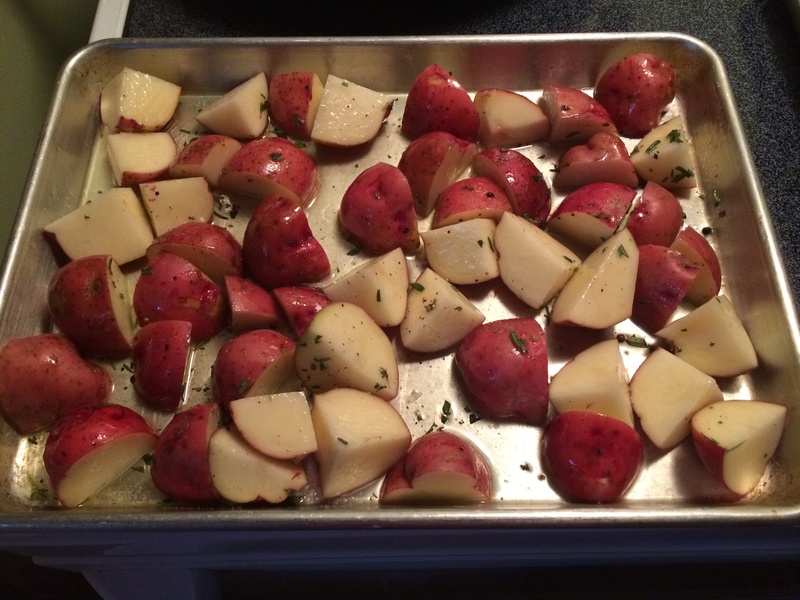 Remove the potatoes from the oven and cover the baking sheet with foil to keep potatoes hot. Adjust the oven to 350-degrees F.
Using a pair of tongs, transfer the 4 chicken breasts to a baking sheet. Cook for 35 minutes or until the internal temperature of the chicken is 165-degrees F. Remove from the oven and cover with foil to keep warm. Note: Times may vary slightly so keep a close watch so as not to burn the shallots. While the chicken is cooking, slice the shallots into thin rings, uniform in thickness. Place them into a saucepan of room temperature Canola oil (or another neutral oil). Turn the heat up to medium and watch the shallots bubble. Those bubbles are water evaporating off. Once they begin to bubble, about 5 minutes, reduce the heat to medium-low. Fry the shallots for 18 minutes. Then watch more carefully, stirring frequently, until they’re golden brown, 2 to 3 minutes more. When the bubbles subside, that signifies the moister has cooked off and the shallots should be golden brown. Using a *spider, transfer the fried shallots to a plate lined with paper towel. Note: Allow the oil to cool. Save it for salads or sautés. Serve on a large platter family style. *Spider: (Traditional Chinese kitchen tool) A wide shallow wire-mesh basket with a long handle used for removing hot food from a liquid.